Montreal, January 21, 2008 - Dorel Distribution Canada is announcing today a voluntary public notice to repair the Schwinn Runabout bike trailer model # 04SC250. The Runabout bike trailer is a single-wheeled, children’s bicycle that connects to an adult’s bicycle by a coupler. The name “RUNABOUT” is located on the main frame of the bicycle. 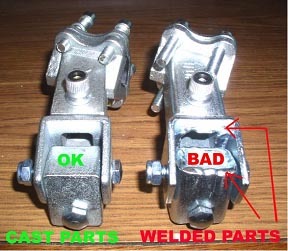 The coupler connecting the children’s bike trailer to the adult’s bicycle has welds that can fail, posing a fall hazard to children. Only couplers that have welded plates are affected by this public notice; bike trailers that have couplers with cast parts are not included. No injuries have been reported to date. Consumers who have purchased this product should stop using it and contact the company to receive a free repair kit by calling the consumer relations toll free line at 1-800-711-0402 between 8 a.m. and 4:30 p.m. ET Monday through Friday.